Didn't get to go to the Inauguration, but I've got kittens for compensation. Note: This is a cat post, with lots of pictures. Back in the beginning of November, my daughter and I visited my mother where she lives in northern Virginia, in the suburbs of Washington, D.C. Both of us were big Obama supporters and had voted by absentee ballot back in MN, but being in the D.C. area during the election was thrilling. We were so excited we *both* wanted to come back in January to go to the Inauguration. As it turned out, my daughter went but I didn't. As I write, she and my sister are getting themselves set up in the D.C. apartment of a friend of my brother (the friend, a Republican, went to Vermont to ski). Even if they can't get on a bus or the metro, now they can walk home when the celebration is over. Why did I not go? Cats. Cats that needed nursing, nursing my husband couldn't perform. So when it came time to buy the air tickets, guessing I would be medicating cats, I just couldn't bring myself to risk wasting the money on non-refundable tickets I would be unable to use. 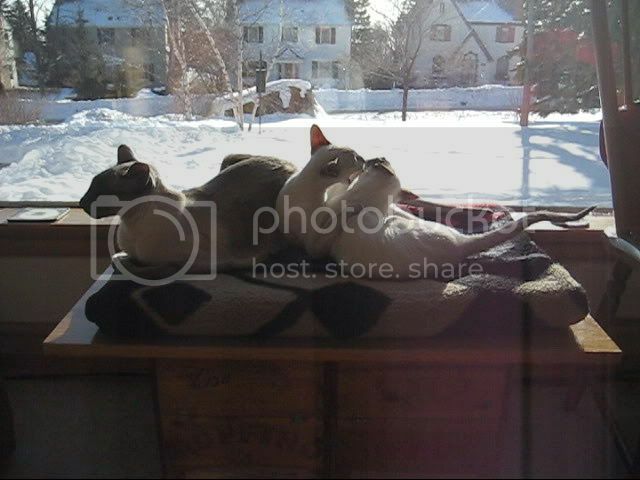 It was actually was on December 25th, Christmas Day (the only day it wasn't going to snow) that I drove to the breeder's house in Wisconsin to pick up our long-awaited kittens, Elsa and Charles. They've been here now over three weeks. As some of you know, my daughter and I first went to visit the cattery back in September to meet and choose our kittens. They were then 8 weeks old. By the breeder's rules, we would not be permitted to take them home until they were 16 weeks old, which wouldn't be till the end of November. So drove the three hours to see them again when they were 12 weeks old, in October, taking lots of pictures, which I posted here. You regulars may remember that the kittens came down with the cold that swept through the cattery in November. It wasn't a life-threatening cold: the kittens remained lively, eating well, but they were sniffling and sneezing, with red eyes and booger-crusted noses. 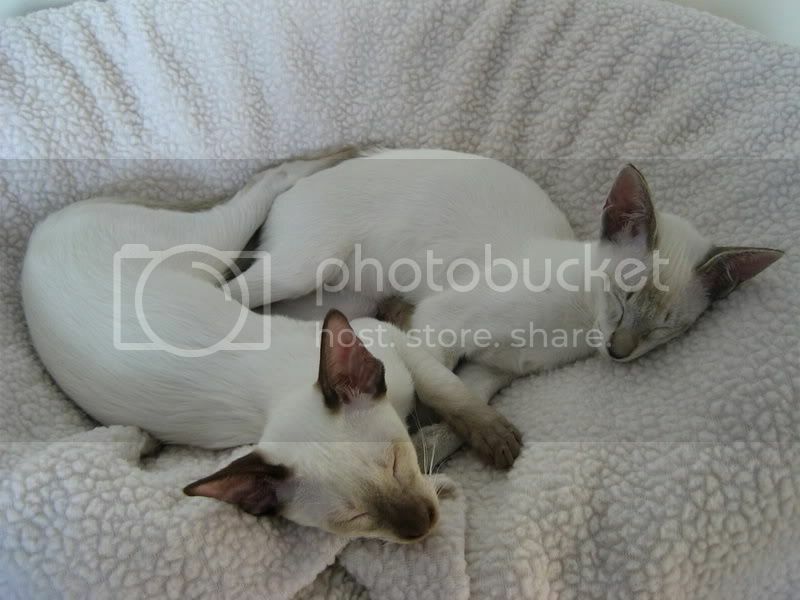 Because the breeder's contract (a standard feature) stipulates that only 100% healthy kittens may be sold, since the contract is a sort of guarantee, allowing a full refund for cats shown to have been purchased with an illness, she wouldn't let us have them. The breeder was very sorry, but, since they continued to be sniffly and red-eyed, they couldn't be sold. When we'd waited a month past the 16 week date, she offered our deposits back, if we wanted to look elsewhere or wait for kittens from a future litter. But we didn't want our deposits back, and we didn't want other kittens, we wanted the kittens we'd chosen, of whom we were already very fond. We said we'd wait. Three and a half weeks later, they both seem to be recovered. I stopped Elsa's meds last week (because she got better first), and Charles's meds stopped yesterday. There are no more blood-tinted boogers anointing the walls and rugs and bedding, and I do not have to compel squirming kittens to take their various medicines. Even Angelo is practically cured. Yes, Angelo, our adult cat, the Lonely Guy for whom we got these kittens in the first place, got sick. He didn't catch the kittens' cold, he made himself sick, because of his own high-strung nature. Angelo found the new kittens fascinating, but also alarming. He'd been our spoiled middle-aged bachelor for six months. Yes, he liked watching them tumble and cavort, but he also found them an infernal nuisance. Why couldn't they lie in the basket nicely? No, they had to tackle him, jump on him, gnaw his ears and tail, trying to get him to play. Angelo was past the wrestling stage long ago. Angelo had always been the pampered baby of our cat family, and now he was being asked to become indulgent Uncle Angelo (as Raoul once was to him). He tried to discipline them, pinning them down with a warning growl and a tooth-hold to the neck (which never fazed them a bit). He tried running away, but they'd just follow him. He became so nervous he wasn't drinking enough. He didn't feel relaxed enough to use the box (for fear of being pounced upon), so he became dehydrated and constipated. A trip to the vet's and stool softener twice a day has made him a well cat. They get on quite well now. The kittens love Angelo, and did love him at first sight. But their idea of showing love is to roughhouse, which is what they do with each other during much of their waking hours. Poor Angelo just wants a buddy to share a bath and a bed. But that's coming along, too, and they are spending more and more time in bed together, and doing a little mutual grooming. Angelo loves that. Watching them getting on so well makes us very happy. Seeing them cuddled up together makes us feel warm and fuzzy all over. We've taken a million pictures, but I will try to show some restraint, but I've never been good at self-restraint. 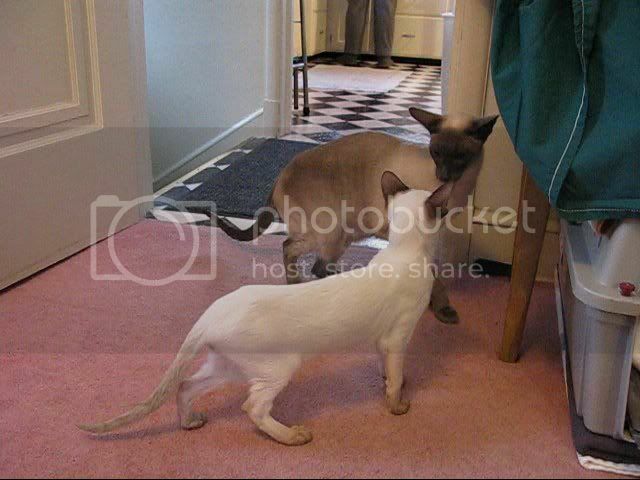 12-27-08 (third day in our home): Charles tries to approach Angelo. Angelo watches the kittens play from the safety of the scratching post. The pictures that follow were mostly taken last week, the second week in January. The kittens love play-fighting, but they also love playing with toys. Elsa is especially good at fetch. She will fetch the "mouse" we throw her and bring it back to be thrown again, just like a dog. Here they are, wrestling in order to determine who will fetch the mouse, lying on the rug behind them. 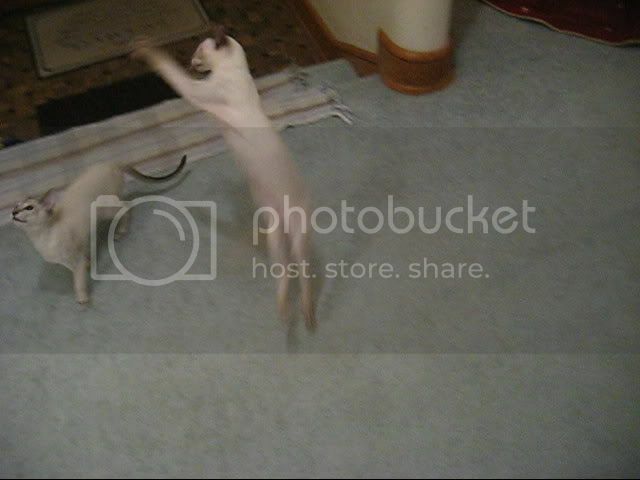 Besides wrestling and fetch, they both love leaping after toys on strings, such as the "bird" they are chasing here. Angelo tends to find a safe corner in order to watch. Charles and Elsa do take time out for lounging and sleeping. If they will settle down, Angelo loves sleeping with them, too. Here Angelo sleeps in the brown chair, Charles next to him, Elsa behind. Elsa's not very visible in that picture, but here you can see she's holding onto Angelo's back leg as she sleeps. But they're content to sleep with each other, which gives Angelo a break. Elsa is on the left, Charles on the right. Last, a few solo shots taken by our daughter (who is giving Elsa the head rub). We're glad he's liking them better, too, Mews. For a while there we were feeling guilty we'd even got the kittens, since he seemed to find them such a cross to bear. As they get older and less "playful" (not what he'd call their behaviour, lol), he'll like them even better. They think he's the greatest, for their part. Ohhh, they're beautiful! They're obviously very special cats, and they've found such a wonderful warm, loving, attentive home. They obviously love their Uncle Angelo! We were lucky to get our kitties when we did, Shirebound. 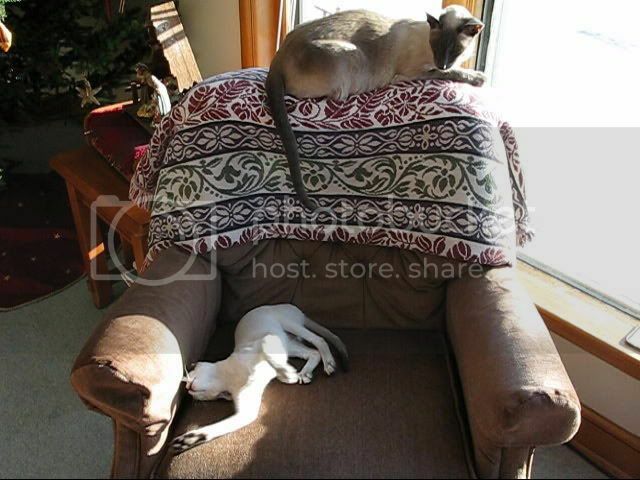 Our breeder is retiring from raising cats. She's 86, you know. She's spry for her age, and has been doing the work of caring for these cats amazingly well, considering, living alone in a very isolated house in the country (her husband died in May). When I asked if it would be o.k. to pick up the kittens on Christmas, in case she had company, she said, no, she wasn't having company and planned to eat a TV dinner! That's why I brought her some Christmas feast (I served it on Christmas Eve, which is when my husband's family come over for the Big Dinner), and a bunch of my cookies and candies. She's going to sell the place and move out west where her daughter lives. She's already placed all the kittens and cats, the kittens sold to families and the older cats going to breeder friends. She said she's going to miss having the cats very much, but that it's really too much for her anymore. My goodness, what exotic looking kitties! What kind are they? Dear 'Uncle' Angelo, he's trying to tolerate them, isn't he? :D Kittens are so full of energy. 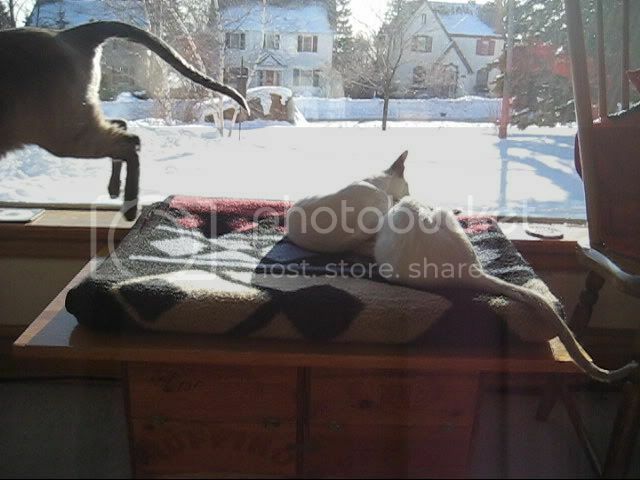 BTW, I have a blankie just like the one in the window! It's the softest and warmest thing. I love it. You have one of those blankies? Aren't they great? When I first began visiting my sister a lot, because we were living in northern CA about ten years ago, she had these blankets in stacks in the living room for people to use. We loved them, and actually used them, since it does get chilly in winter where she lives. So when we got our hous here in Duluth, I looked for some to buy so I could have a stack in my living room, too. At the time, I didn't think any would end up as favourite cat beds! 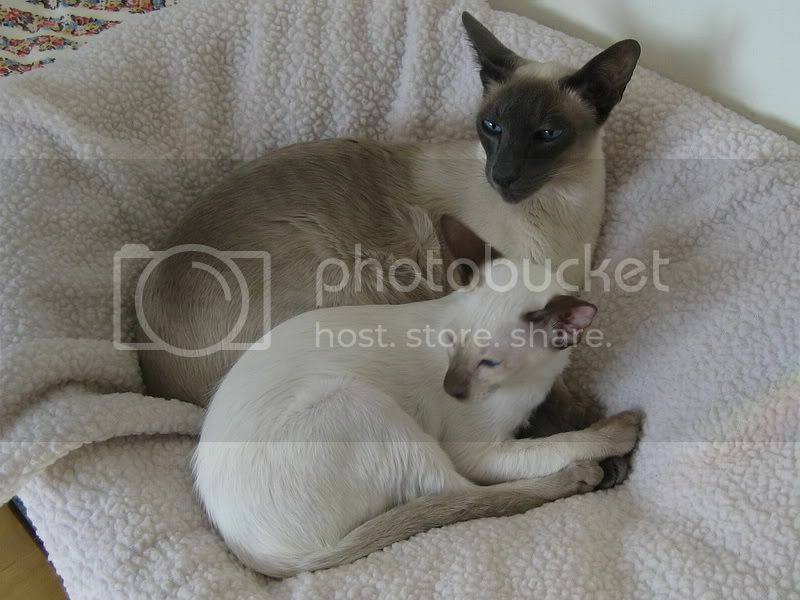 They are Siamese cats. The darker places on their bodies are called their "points". The points darken as the cats age (Angelo's eight so he's as dark as he'll ever get. ). Angelo is a blue point. 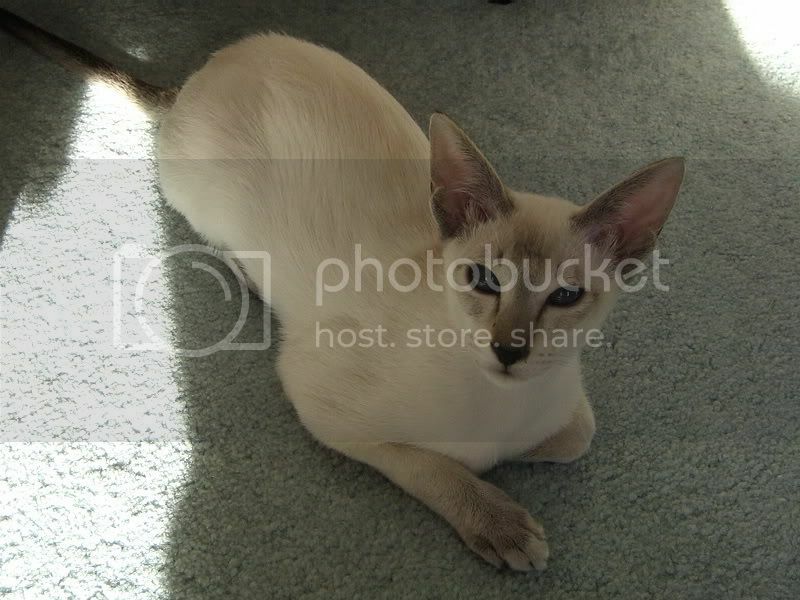 Charles is a chocolate point (medium-dark brown points). He'll darken up as he grows older, too. 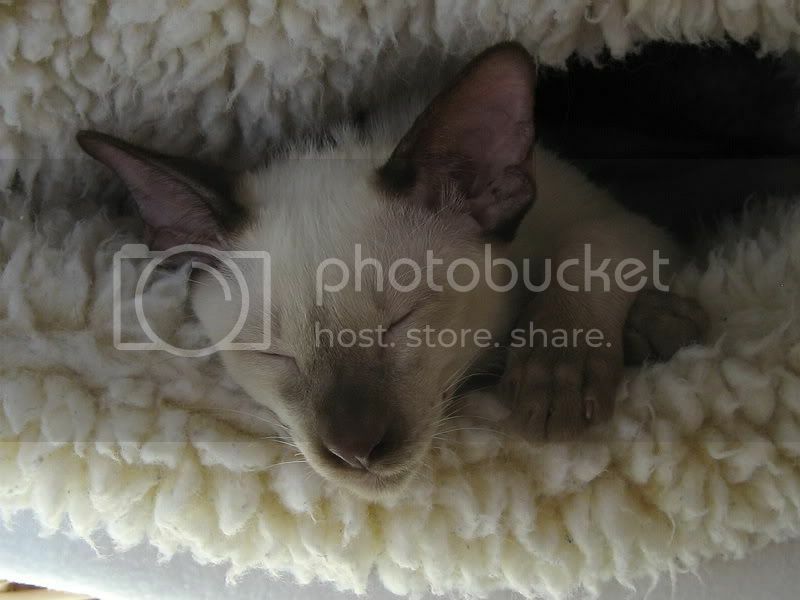 Our cat Raoul, who died in June, was a chocolate point, very big and handsome. Elsa is what is called a seal lynx point. 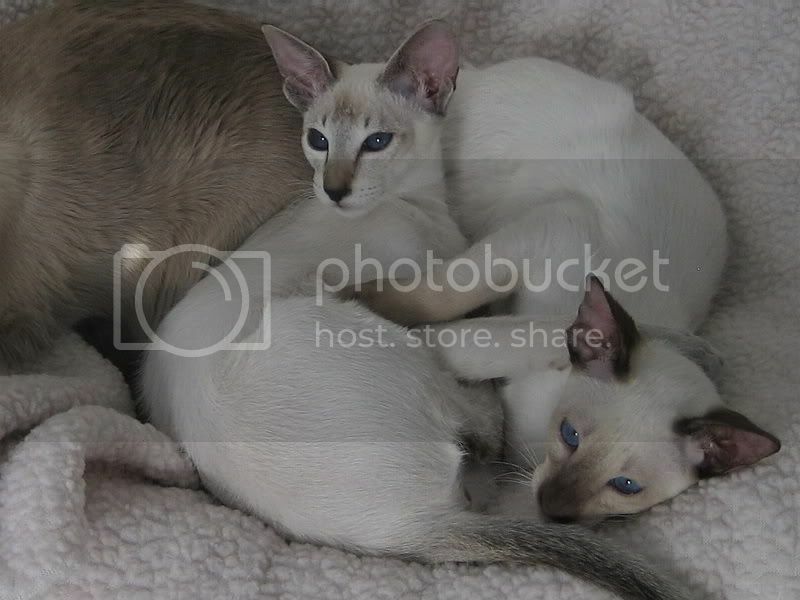 The classic Siamese cat colour is called "seal point". As adults they have tan bodies and off-black, points, very dark. 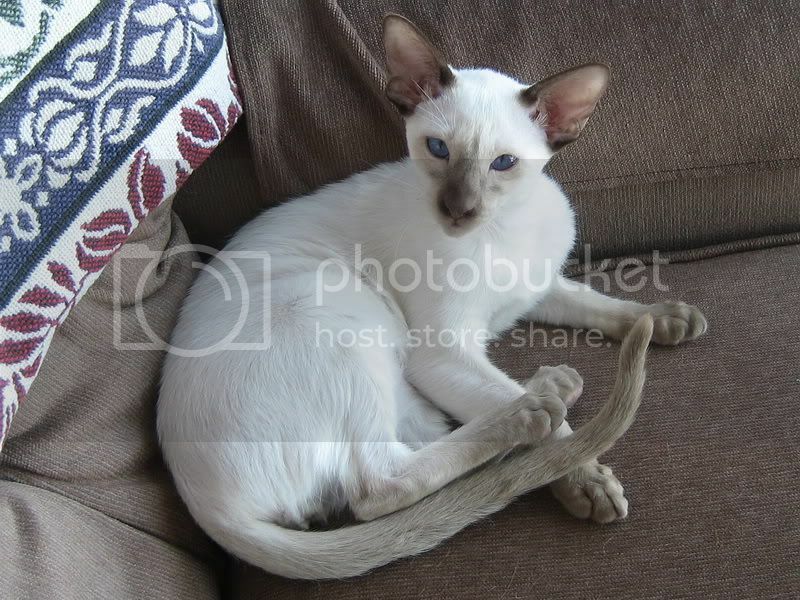 But she's also what's called a "lynx" point, meaning that her dark areas are patterned as well as coloured. It's called "lynx", and it does look rather exotic, but the pattern resembles that of a tabby. We've never owned one of these exotic varieties, just the classic Siamese colours. But Elsa was such a lively little cutie at the cattery, so full of personality, we definitely wanted her. Charles seemed like Mr. Mild and Sweet at the cattery, never saying a word, but he's turned out to be the big talker, and always wants to wrestle and play. We love them both, and are happy Angelo is getting to like them better as he gets used to the little scamps. What lovely faces they have! Hi, Ann! Did you think of attending the Inauguration at all? Rachel has called three times tonight, asking us to look up scheduling info. on the internet (they haven't got a computer at the house in D.C. they're staying in tonight). They've been to the Mall today and said it was full of people milling around taking pictures, but that it was still easy to get around. Tomorrow may present another scenario! They want to get there as soon as the check points open. Oh, I'm so glad it's working out and Angelo is adjusting! But how could he not when he has people who love him and who know how to tell the story from his perspective so well? I love the comparison to a koala bear. It *does* look like a koala's nose. I've been thinking he's got kind of a dog face (whereas Elsa looks fully like a cat), but I think a koala bear is a closer comparison. Your cats, like you, are so elegant. 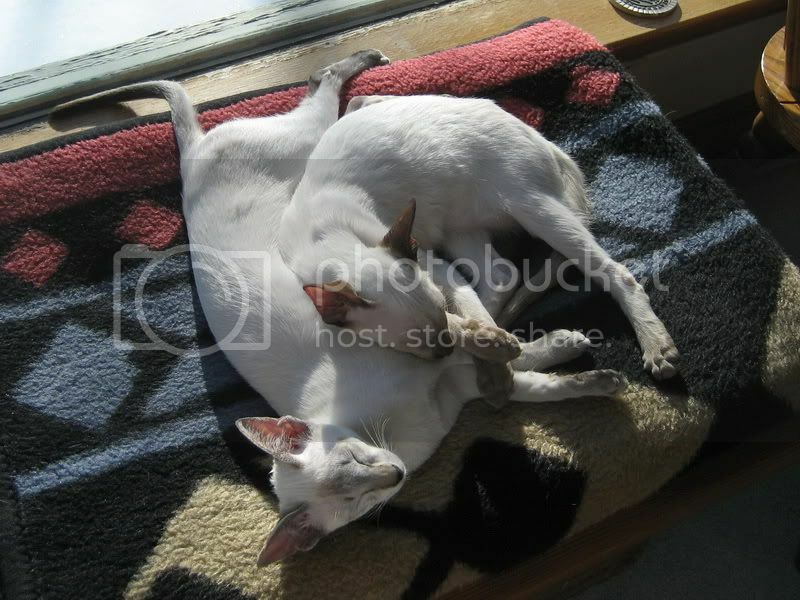 That said, they're just as playful and cuddlesome as any other kitties too! :) Thank you for sharing these three beauties. Yes, they are just as cuddlesome, in spite of their elegant appearance. In fact, over the past years we have remarked, looking at Angelo doing yet another stupid, lovable thing, "He looks so handsome and exotic, like an Egyptian statue, but he's really such a dope." I think the contrast is endearing. Uncle Angelo, Charles and Elsa are so beautiful! Yes, it's nice that there's finally some sun to rest in! It's been so snowy and grey here (typical), besides tremendously cold. 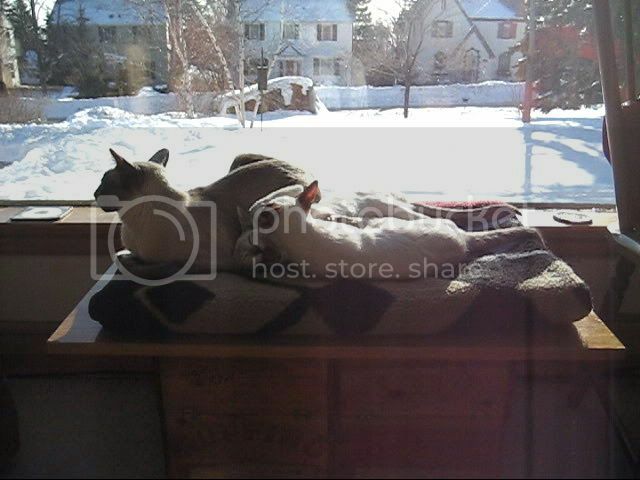 Thank goodness for a heated house! 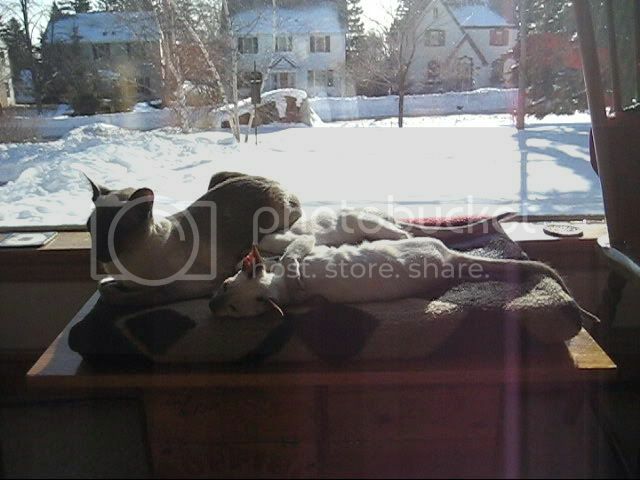 And the snow is so much prettier in the sun, especially when viewed from inside, holding a steaming cup of tea. I'm so glad they're fit and healthy now. You waited long enough. And what a lovely thing you did by taking the breeder Christmas dinner! You probably made her day. * The "standoff" between the old and the young - Angelo's tense stace is classic. * Angelo beseiged by the youngsters at the foot of the scratching post. 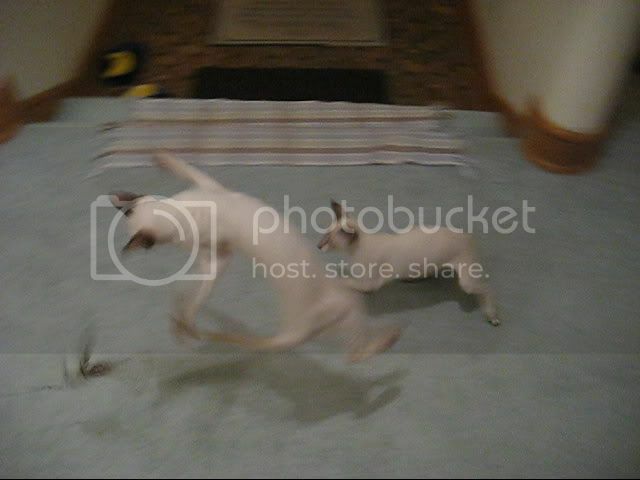 * The video caps, especially the last, "I'm out of here!" feet disappearing stage left. * The spectacular gymnastics display. * The innocent sleepy babies. Um, that pretty much makes all of them my favourites! Thanks, Maewyn. Yes, the photos are very good. Rachel took them. She's very good at taking their pictures, perhaps because they like her so well and feel so at ease in her company. She's the one who plays with them the most, and who is most likely to sit on the couch and watch a show, which means rolling around and playing on or near her. I wonder what Banjo would think of such kitten interlopers coming to live with him....? I've been wondering whether the kitties were already with you and now I found your post. I'm sorry you missed the inauguration, but at least now you have a nice addition to your family and poor Angelo is not alone anymore. Glad to see that he's doing well with Elsa and Charles! Hi, Melyanna. Yes, they've made themselves *very* at home. I watched the Inauguration on TV today, enjoying the event very much, being a supporter, and talking to our daughter via cellphone about what it was like to actually be there. She and my sister got separated by the crowds right away, but they are going to find each other again this evening. My daughter made it onto the parade route, power walking, got through a check point and, because they were virtually empty, was allowed with other regular people to stand on some bleachers near the Capitol. The presidential limo drove by, but the Obamas were inside and difficult to see. In order to get another look at them, in case they got out of the car and walked as they drove to the reviewing stand, she tried to run ahead of them, leaving a check point to go up a few blocks. But then she couldn't get back onto the parade route! That's why so many of those bleachers had no people in them; if they didn't make it over from the Mall (the big mile-long strip of public park where people stood for the Inauguration) in time, they couldn't get through the checkpoints to stand on the parade route. She was really disappointed, but she's glad she got to go. She stood on the mound around the Washington Monument for the ceremony, feeling excited but watching what was happening on the nearest giant viewing screen. She wanted to try and get closer but she said she could not move an inch in any direction, it was so packed. They're beautiful, Mechtild. Home at last! I'm so pleased to see Angelo and the little ones are settling in together. It does gives you a warm, fuzzy feeling to see them all curled up in a bed, well-fed and warm, snoozing away. I always loved to see our cats stretched out on their huge cushion in front of the fire ~ and it's the same with our dog now. How kind of you to take the breeder her Christmas dinner, and how sad to think she would have spent the day alone if you hadn't gone to collect Charles and Elsa. It's wonderful that your daughter went to Washington for the inauguration of President Obama. She may not have had a perfect view of the proceedings, but she was there to experience history being made ~ a day to remember all her life. Hi, Blossom! Rachel had a never-to-forget time, even if she could not get close. I think she must be a true fan; she wanted (but didn't get to) tour the White House this morning, an activity that would have been as appealing to her (a few years ago) as digging up rocks in our yard. She said wistfully about not being able to see the Obamas when they walked the parade route, "Well, maybe when I'm in the Coast Guard he'll be at something and wI'll be there and see him in person then." I was impressed. I always loved to see our cats stretched out on their huge cushion in front of the fire ~ and it's the same with our dog now. Ah! Congrats on the new kitties! 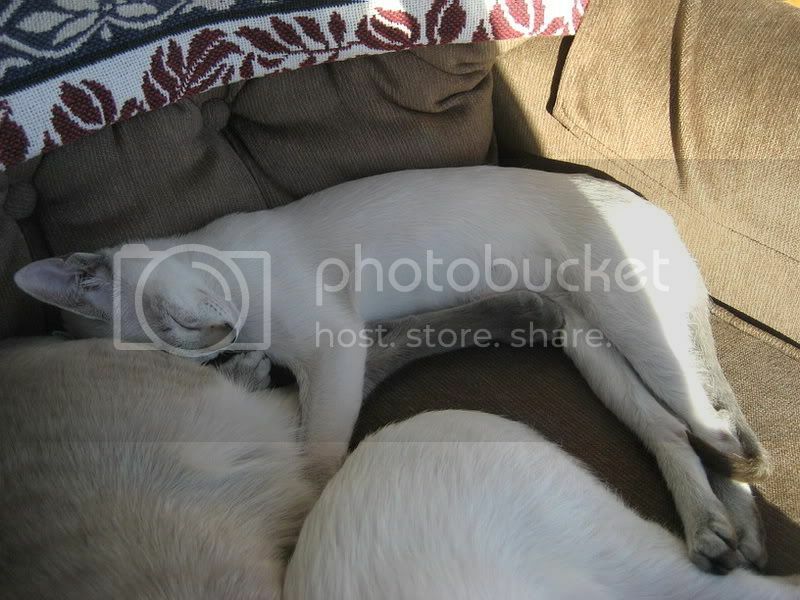 I really love the pic of Elsa holding onto Angelo's leg as she sleeps. SO adorable! Yeah, they're really cute. But we're a bunch that are suckers for cat cuteness. Hope you're feeling better and better, Hewene! I missed this post because I've been away on a Christian conference on the south coast. Your kittens are wonderful! So cute watching them play: they're such bright sparks of life. Elsa really does have an extremely beautiful face. Is it my imagination, or are her eyes a darker shade of blue than Charles's? 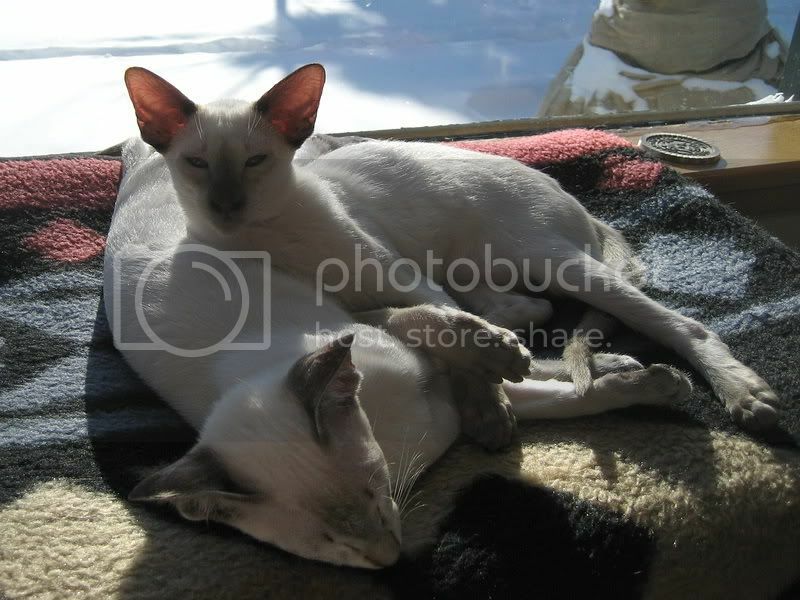 My grandmother had a Siamese cat called Ming (the traditional round-headed Siamese) but she was not a particularly friendly cat and could be quite scary on occasion: fractious and scratchy. Ming was not representative of her race though. 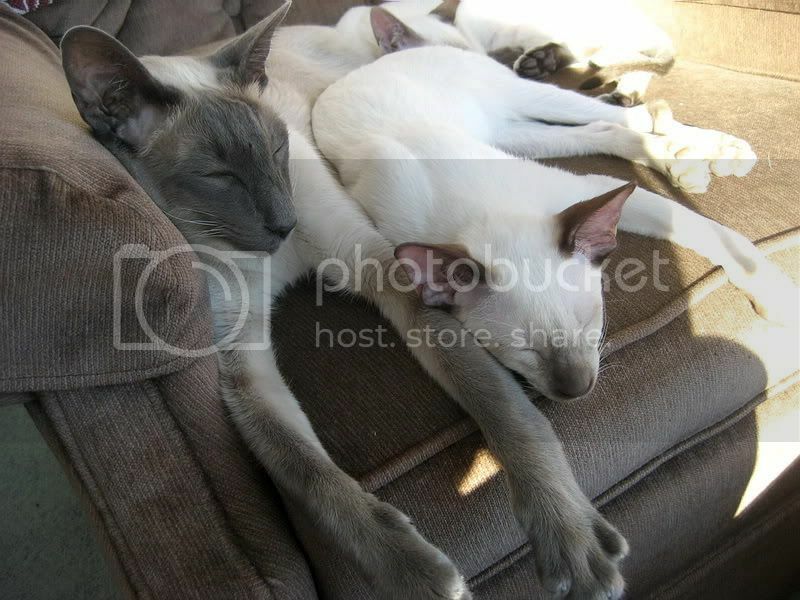 How could Tolkien say Siamese cats were 'of the fauna of Mordor'????? So Ming was not nice? 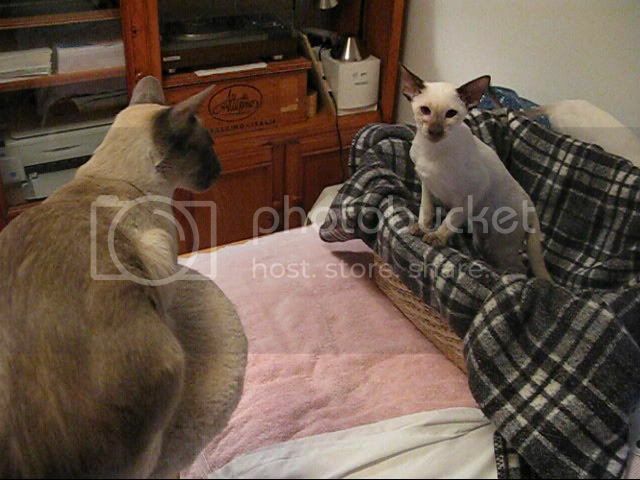 My mother had one Siamese who was not nice, either. In fact he was neurotic and cranky, biting or scratching anyone he felt like. But she was the devoted faithful type, figuring if she didn't love this cat, who would? 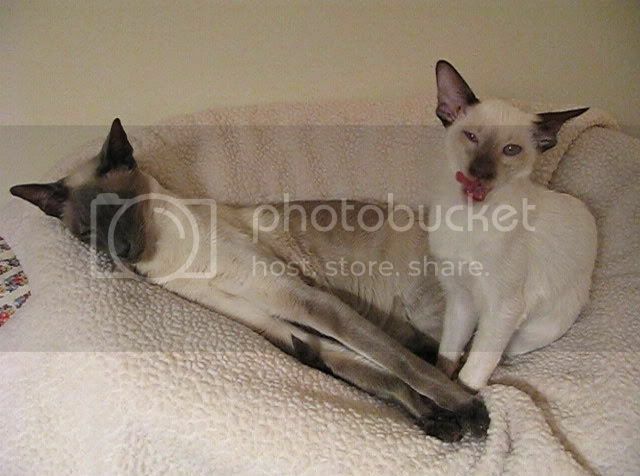 All our Siamese have been loves. Hmmm, think I'll have to go find one of them and smoosh it! P.S. What sort of a conference? Awww! The little ones are SO delightful (and pretty)! Have much fun all together, you all! Yes, we are having fun, Whiteling. Last night the kittens were wild things, racing up and down and around the length of the house for an hour straight. It was so fun to watch. As someone who has not yet managed to force herself to do much in the way of exercise, it was even a vicarious thrill. Angelo did not race but watched, looking dignified-a new look for him.